St. Petersburg’s charm is completely different from that of Moscow, and no wonder: there is a 600-year gap between their founding years. Moscow keeps the history of Russia’s medieval times and traditional lifestyle, while St. Petersburg from the very beginning has been the embodiment of Russia’s westernized culture and ideas. Its founder, Peter I the Great, was determined that 18th century Russia needed to borrow new ideas and material culture from the West, and was a big fan of maritime empires, such as Netherlands, so much that he used Amsterdam as architectural model for his new capital.Looking at St. Petersburg today, it is hard to believe that the city rose from impassable northern marshes, but its ever-changing unpredictable weather gives you the chance to see all major landmarks in different light throughout your stay: from gloomy wet autumn days to summer weeks of white nights when the sun does not set at all. 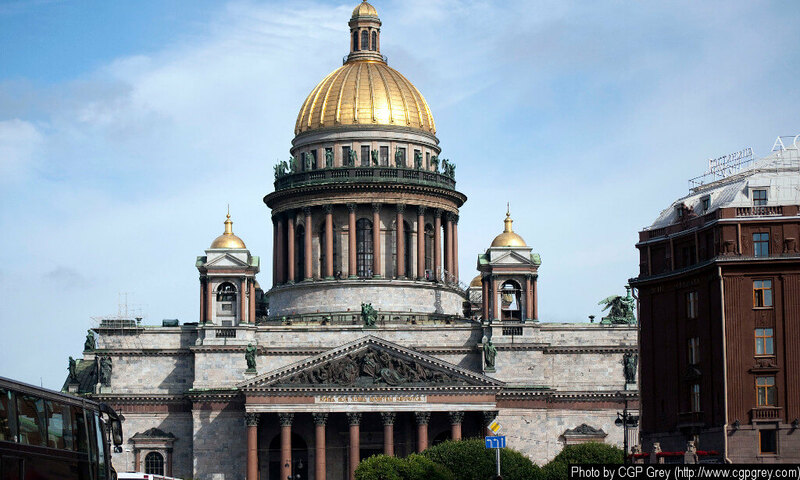 Kazanskiy Cathedral on Nevskiy Avenue, St. Petersburg’s major street, is hard to miss when you navigate through the city center. It still functions as Orthodox religious center and can be visited for free, including the evening service. A fortified settlement existed on the site of modern-day capital all the way back in 11th century, but the first mention of Moscow appears in a medieval manuscript in 1147, as a place where local king Yuri the Long-Armed gathered with his buddies from a neighboring kingdom. In the middle of 19th century, the emperor suggested that Russia should have annual celebrations in honor of the former capital (by then, St Petersburg had taken its place as diplomatic and administrative center of the country). Moscow city day is every kid’s favorite holiday and one of most cherished childhood memories for many adults. Every year, the celebration includes more and more events across different corners of the city, reflecting the variety of its cultural heritage. The city’s birthday is celebrated every first Saturday of September, but the program for the weekend usually appears online in mid-August. Public transportation is working long into the night on this occasion, allowing you to commute between parks on the outskirts of the city and downtown music bars and clubs. The Moscow city day usually offers free access to multiple museums, art spaces, historical houses and galleries – both for those who were born and bred in the city, and for expats and travelers. Some museums offer special tours on this day: last year, for example, the Home Museum of Mikhail Bulgakov, one of the most prominent Muscovite writers of the early USSR, organized urban walks and opened up hidden rooms for those interested to see Moscow through the eyes of the writer and his wacky extraordinary characters. Sporting activities are not scarce either: you can get a free lesson on a paraplane or partake in a bike parade through the streets of Moscow, visit the biggest public swimming pool in the city or join go-cart racing. In the center, you will almost always stumble upon soap bubbles or dancing flashmob, as well as open creative spaces for graffiti artists, musicians, designers, photographers and poets. When it comes to music, the choice is really vast: from well-known bands to rising independent artists, international performers and urban classical orchestras.And then of course, fireworks. They usually start around 10:30PM and are best observed from Moscow’s bridges, skyscrapers, and viewpoints, such as the one opposite Moscow State University, or Poklonnaya Gora. One thing you can be sure of: the city will be crowded, and it will be unforgettable. Moscow metro, or Metropolitén, is known to be one of the most beautiful underground systems in the world, with the diverse and luxurious decorations of its oldest stations, modeled on architectural styles of classical temples of antiquity, gothic cathedrals, traditional Russian art, and much more. As Moscow grows, the metro is also expanding, but newer stations do not lack designer’s touch either: everything from minimalistic approach to futuristic imagination that will boggle your mind as you are taking a ride outside the city center.Although the first plans of underground railway system were created back in the end of 19th century, the metro was officially built and opened only in 1935, in Stalinist era, and its architecture was not simply decorative, but ideological, aiming to show the power of communist government and the USSR both to its citizens and foreign guests.Moscow metro is notable not only for its architecture, but also for the mass of urban legends that surround its construction and everyday life. First of all, one of the most convenient things about Moscow subway is the circular line. The legend says that it was not on the original metro plan that was brought to Stalin, but as he was sipping tea (or coffee) from a large cup he placed it on top of the blueprints, and the cup left a brown ring on top of the metro lines, which engineers, upon consideration, found quite a smart addition.Moscow subway is also rumored to be filled with extraordinary flora and fauna, and some school and university groups even travel on expeditions down there to study microbiology of the underground world. The railway tunnels are said to be inhabited with ginormous radioactive rats that glow in the dark and can maul a stranded railway worker or two. There are also quite real stray dogs that you can see inside the metro cars: do not worry, they are not aggressive, and actually quite independent, passing though turnstiles on their own (they never pay though) and commuting between the city center and green suburbs. The biggest conspiracy surrounds the so-called Metro-2, a system of underground metro lines that lies beneath the official metro, around 50-100 meters below the ground. This system was commissioned by Stalin in case of war, and was later developed to serve as nuclear shelter and the way for the government to escape any sort of cataclysm that would wipe out the rest of the city. The four lines of Metro-2 supposedly originate under the Kremlin and go all the way to the main building of Moscow State University. Many students attempted to find hidden access to the university catacombs, but even if someone did they never returned to tell the story.There are also some esoteric interpretations of the 12 points where radial lines cross the circular line, corresponding to the 12 zodiac signs, and a legend about the ghost train that stops at the various stations with its lights off and doors shut – but sometimes it opens the doors and tries to lure in unsuspecting commuters and drive them into nowhere.Anyway, the Moscow metro is indeed a place full of wonders, and much cheaper than any other urban commute system in Europe. Photography is allowed without special permit, unless you are a professional photographer or videographer and planning to use tripod, flash, and spend considerable amount of time adjusting the settings. In this case, in order not to stand in the crowd’s way, you need to obtain a permission for photography at specific allocated time and off-peak hours. Getting a visa to Russia might sound like complete nightmare if you read some of the travelers’ accounts online – they are not always accurate. Russia is not North Korea, and you do not necessarily need to go with an organized tour group and fit all your travel plans within a specific time limit. 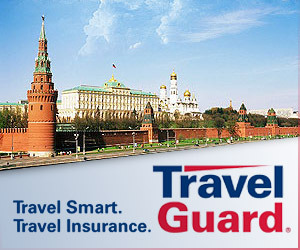 Tourist visas to Russia are valid for up to 30 days, and can be issued with single or double entry. If you want to stay longer, consider applying for a business visa, which can be used by people attending conferences, exploring business opportunities, or going on a research trip. This visa takes longer to process, but will allow you to stay as long as 6 or 12 months, with single, double, or multiple entry. First of all, you need a Visa Invitation. If you know somebody in Russia, they can provide you with a private invitation, which they must obtain as a notarized copy at the Ministry of Foreign Affairs. It is a bit of a cumbersome process that can take up to one month, and your consulate will require original documents for the application. So instead, you can get the invitation from a certified agency. It will cost you around $50, and within a few hours scanned copies of a tourist voucher and reservation confirmation will be sent to you by email. When applying for the invitation, you will be prompted to indicate the cities you are planning to visit and hotels you are planning to stay at. If you do not have any fixed plans, staying with friends, via airbnb, or in a hostel, simply pick any hotel on the list and make sure to write it down on the visa application form as well. If you are taking the Transsiberian train, pre-booked tickets may be a good substitute for a hotel reservation. Finally, you will require a travel insurance for the duration of your stay. Choose your company wisely, and mind that ordinary travel insurances do not normally include special types of activities and extreme sports… in case if you are looking for some thrilling skydiving experience or cross-country skiing in taiga in the middle of January. Find your local Russian consulate and apply. You can always use services of our agency to avoid queueing at the consulate by yourself, and send all the documents by post. Along with the above mentioned documents, there is a visa processing fee that starts at $255 depending on your type of visa and how fast you want it to be issued. Final note: upon arrival to Russia, you are required to register your visa within 7 business days. Your hotel can do it for you for a small fee (depends on the hotel), or the agency that issued your invitation can provide you a hassle-free registration for additional fee – ask them when applying for invitation. If you are staying with friends, or via airbnb, the owner of the property can register your visa at any local post office: they will need to bring $5, a copy of your passport, and their Russian ID with registration (propiska). Make sure to carry your passport with the visa and registration with you at all times, and know the phone number of your embassy in Russia, as the police are known to be interested in tourists, especially in popular locations around Moscow and St Petersburg. This entry was posted in Visa and tagged Russian Visa, Russian Visa Invitation on May 13, 2015 by Admin. 5. Transsiberian train & Lake Baikal. The ultimate dream for backpackers, flash packers and all types of adventure seekers, Transsiberian train bears the romantic flair of old-school railway journeys across the flat surface of Russian plains, over the Ural mountains, and further into the depths of Asia. Listening to the rhythmical melody of train wheels, drinking tea from a glass wrapped in a soviet metal glass holder, attempting to communicate with local villagers at every station, where old ladies sell fruits and vegetables from their gardens – you can spend anything from a couple of days to a couple of weeks on Transsiberian train. Lake Baikal is one of travelers’ favorite destinations on this route. In the summer, you are free to travel around its islands and try to catch on camera the elusive endemic species of birds and mammals. In winter, the entire lake turns into a perfectly transparent ice palace where even the time itself freezes until the spring thawing season. In the north of Russia, in the middle of the White sea, lies the Solovetsky archipelago, and upon those islands in the 15th century two monks founded a secluded cloister, where anyone searching for peace and serenity of nature could find their last resort. Peace and quiet of this remote northern monastery served many purposes throughout its history: most notably, for about 3 centuries Solovki had been used as a prison, and in Soviet times one of the first forced-labor camps was started here, after the Bolshevik authorities put and end to monastic life on the island. Nowadays, Solovki is worth visiting for its breathtaking nature, traditional wooden architecture and fascinating library of old manuscripts and books. The Golden Ring is a common name for several culture-and-history routes around the European part of Russia. All the cities and towns included in the Golden Ring are famous for their remarkable architecture and cultural heritage: the golden ‘onion’ domes of Russian Orthodox churches is what dominates the cityscape of Vladimir, Suzdal, Kostroma, Yaroslavl, and other towns, and tall bell towers of their monasteries fill the air with the clear ringing melodies during church festivities and holidays. Despite the communism’s efforts to put an end to religious chapter of Russian history, here it is very much alive, and all around the Golden Ring curious travelers can find the wonders of traditional craftsmanship. 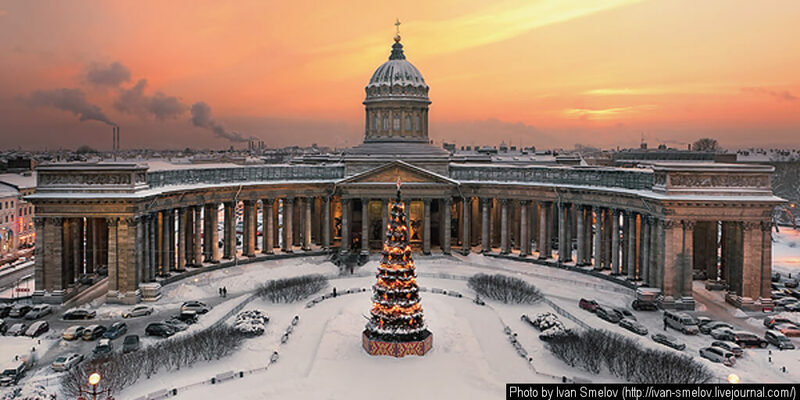 Peter I The Great’s favorite playground and the capital of the Russian Empire for two centuries, Saint Petersburg in Russian culture and literature is frequently associated with the dark side of Russian soul, the northern cold and drizzle, the transformed and deformed time and space. Here, lovers of Russian literature will find what they seek in the streets and courtyards that inspired Dostoevskiy, Gogol, Tolstoy, and art and history enthusiasts will appreciate the fascinating collections of The State Hermitage Museum. Moscow has seen fire and ice, revolutions and historical plot twists: founded in the 12th century, it served as a capital of medieval Russia, then lost its status for about 2 centuries to Saint Petersburg, and regained the title in the Soviet era. Now it is a modern and bustling capital filled with skyscrapers, crazy traffic, international restaurants, hip cafés and smart masses. Some say that the glass and metal of modern architecture do not suit her: and Moscow is always a She in the eyes of its citizens. Some say it is beautiful how layers of history stay preserved among Moscow’s old medieval structures, colorful cathedrals, grey ‘match-box’ apartment blocks and massive bridges of Soviet era, and tall skyscrapers reflecting the evening sun. 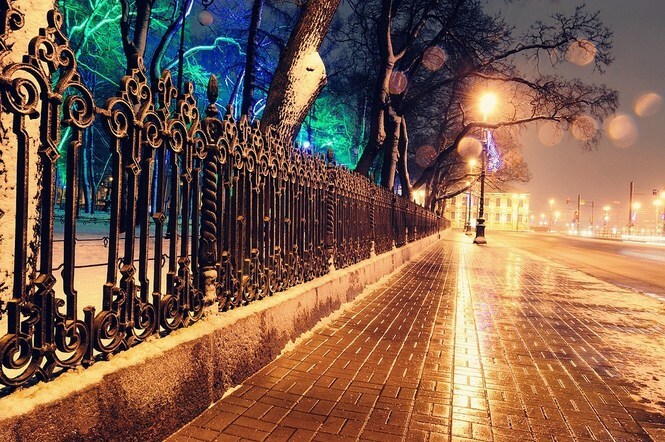 This entry was posted in Destinations and tagged destinations, russia, travel on May 3, 2015 by Admin.